Observations resulting from an increased scrutiny of seed-borne microbes are challenging our traditional concepts of endophyte transmission, but few of these studies have focused on trees, particularly the conifers that dominate many forested ecosystems. We reviewed the literature on pine seed endophytes and examined two pine species, pinyon (Pinus edulis) and ponderosa (P. ponderosa), in northern Arizona by culture-based and/or culture-independent methods. 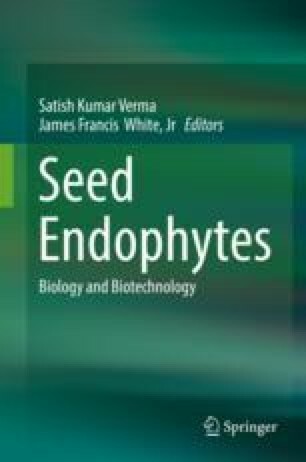 We predicted that the long seed development period in pines would be conducive to the assembly of a diverse seed microbiome. In the culture-based studies, the following patterns emerged: (1) pinyon pine had higher numbers of microbes isolated from its seeds than ponderosa pine. (2) One pinyon phenotype that is herbivore susceptible but drought tolerant (H−D+) had more culturable microbes associated with its seeds than the herbivore-resistant/drought-intolerant phenotype (H+D−). (3) H−D+ bacteria were of a different phylum (Gammaproteobacteria) than H+D− pinyon bacteria and ponderosa pine (Firmicutes). In our culture-independent study, fungal DNA sequences obtained from ponderosa seed were primarily basidiomycete fungi, many of which were ectomycorrhizal species. We infer that the presence of symbiotic fungal taxa and the relative absence of common environmental fungi in two species of pine seed imply filtering of the seed microbiome. We discuss endophyte transmission and propose a new mode, reticulate transmission, which combines elements of both vertical and horizontal transmission. The authors would like to thank the John and Pit Lucking Family Professorship for the support of CAG. We would also like to thank Phil Patterson and Amy Whipple for providing seeds. The manuscript was improved by critical input from Julia Hull.